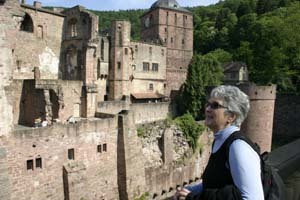 Here our guest Ruth Ertel takes in one of the most beautiful ruins in Germany. For more information about Mark Twain’s stay in Heidelberg and in Germany, purchase the excellent book ‘Mark Twain in Heidelberg’ edited by Werner Pieper, ISBN 3-922708-12-9. If you are unable to obtain the book just let me know and I will be happy to send you a copy.